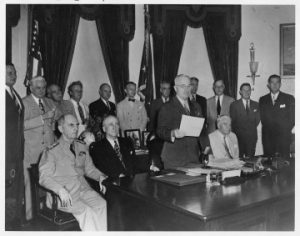 Three full days had passed since the United States, United Kingdom, China, and the Soviet Union had jointly submitted their formal reply to Japan’s terms of unconditional surrender that they had issued on August 10th (see our blog post from August 10, 2018). Finally, at 6:10 PM on this day 73 years ago, Secretary of State Jimmy Byrnes received a message from the State Department of Switzerland. It was what the world had been waiting for: Japan’s acceptance of the terms of surrender. Secretary Byrnes then rushed to the White House to deliver the document to President Truman. 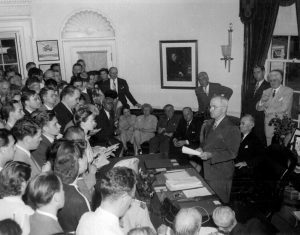 Just before 7:00 PM, newsmen pushed into Truman’s office to listen in on what the President was about to say. Indeed, there was a lot of excitement in the air. World War II had killed tens of millions of soldiers and civilians; it was the worst catastrophe that had ever struck the human race. It was now over – and everyone crammed into the Oval Office knew that the right side had won. Klieg lights nearly blinded the President as he stood up from behind his desk, holding the document in his right hand. All the top aides, advisers, and heads of his administration sat or stood around him. Even his beloved wife, Bess, was seated just a few feet away. Truman looked as if he had just emerged from a bandbox. His double-breasted navy blue suit was neat and pressed – his style was immaculate for such a moment. “All in!” a Secret Service man announced. Truman glanced at the clock. At exactly 7:00 PM, with his shoulders squared, he began reading slowly and clearly from the document in his right hand. 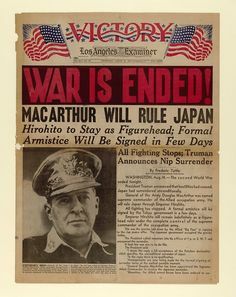 He went on to announce General Douglas MacArthur’s role as supreme allied commander over Japan, and that the proclamation of VJ-day (Victory in Japan) would have to wait until the formal signing of the unconditional surrender. In any event, World War II was now essentially over. The hundreds of thousands of Allied soldiers who were preparing to go to Japan to engage in man-to-man combat could now breathe a sigh of relief.